During my lunch today I read the April/May 2018 copy of your magazine (along with Harvard Business Review) and enjoyed just about all of it. One article was of particular interest: “The Goldilocks Concept.” I enthusiastically read and silently cheered on lines in the article such as “A hybrid model, in which we have expert veterinary leadership coupled with great business acumen ….” I thought this was exactly what the veterinarian owner/practice manager relationship was all about. However, the article then went on to suggest that veterinarians could “easily” acquire strong business and leadership skills since they had “mastered” organic chemistry and physics. While I have the utmost respect for the education that a veterinary student must endure, I do not believe all veterinarians have the skills needed to be exceptional business people, managers and leaders. What’s more is I do not think they can be full-time veterinarians and full-time business managers and do both well. The article completely failed to mention that if independent practices had seated the right people as business leaders within their practices years ago, not only would those hospitals have been more successful but the corporate model would have gone up against an already strong business model, not a fragmented, flailing one. Today’s hospital managers are highly educated, highly credentialed professionals who have skills that some veterinarians simply do not have, will not have and cannot learn regardless of how they did in physics and organic chemistry. All those associate vets uninterested in ownership — well, they are uninterested because they don’t have this business acumen or the desire to even attempt to acquire it. They want to practice medicine and have a life outside of practicing medicine. Every time I get the chance, my advice to third- and fourth-year vet students when they ask me how they can have this is simple: Find yourself a great practice manager, have a trusting, transparent relationship with them and allow them to be exceptional managers while you are an exceptional vet. The perfect hybrid is one with an owner-veterinarian who establishes exceptional veterinary medical protocol, has a basic understanding of business, has a clear vision of the practice goals and has a strong practice manager to help facilitate that vision. Adrienne Simmons-Turner is practice manager at Rice Village Animal Hospital in Houston. 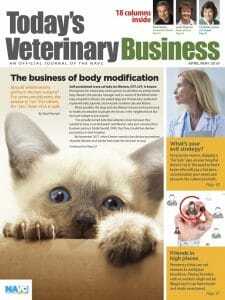 Today’s Veterinary Business provides a forum for readers to comment on anything in this journal and on any topic relevant to the business of veterinary medicine. We welcome letters of 600 words or less — the shorter, the better. Please email submissions to editor Ken Niedziela at kniedziela@navc.com. Include your name, professional degrees and credentials, workplace or city of residence, and contact information.